Blazing Hot Wok: Have a happy Christmas and eat some prime rib! Have a happy Christmas and eat some prime rib! Did I ever mention I love my neighbors? Yesterday our neighbor across the street hosted a neighborhood (+ family friends) holiday potluck party. As always, it was all good times. It was too much of a good time for Hubby and he paid for it today…at work. HEHE! Originally I was going to bring some kind of appetizer/finger food, but when I found out my local grocery store was having a sale (to the tune of $4/pound!!) on prime rib roast, I couldn’t resist. I’ve always wanted to try fixing one, but was nervous to pay $50+ to experiment on a beautiful cut of meat. Well, it turned out to be super easy thanks to my $6 meat thermometer. I've started new tradition this year--rib roast for Christmas dinner! If you do a little research on how to make a standing rib roast, there are a few different ways. I like searing the meat at high heat, then going low until it’s done. This requires a little more roasting time, but I think that allows for better browning of the exterior without the threat of burning. About the seasonings...I think you can choose just about any seasoning combination you like and the roast will still taste fantastic. All that’s required is plenty of kosher salt and cracked black pepper. Everything else is a bonus. I used garlic and since I had some thyme, I threw that in too. Get creative. Try toasted and roughly ground cumin and coriander seeds for a Caribbean flavor or dry mustard for a more traditional English taste. Peel the garlic and mash it in a mortar with the chopped herbs. Add the oil to the paste and rub the seasonings over the meat. Push the spices into any little crannies and crevices. Using the kitchen twine, tie the roast at regular intervals. This will prevent any of the crusty parts from peeling off during cooking. 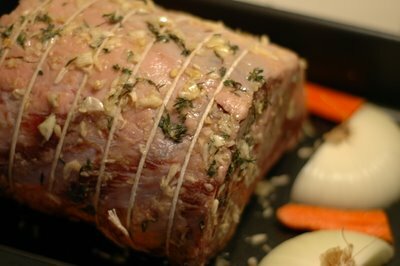 Leave the roast on the counter for a couple of hours to bring to room temperature. I know some people may be freaked out by the thought of leaving meat out for so long. Trust me, it won’t get warm. It won’t even really come to room temperature. You just want to be sure to take the chill off so it will sear more efficiently and reduce the total cooking time. Preheat the oven to 450°. Put the roast in a shallow roasting pan, rib side down, and rub the roast with plenty of salt and pepper (don't be shy!). Roast for 20 minutes. Resist the urge to open the oven no matter what you hear or smell (unless it’s an oven fire, of course). Turn down the heat to 300° and continue roasting for about 1 hour. After that first hour, rotate the roasting pan to promote even browning. I have a convection oven, but I still find it’s helpful to rotate if I’m doing a lengthy roast. This is also a good time to check the temperature. Don’t expect the roast to be close to done, but it’s still good to get an idea. Insert your thermometer into the thickest portion of the meat. Be sure to push far enough into the roast to get an accurate reading. If you only go an inch in, the reading will be deceptively high. Go in a little farther and the temperature will drop. My magic number is 130, but anywhere from 125° to 130° will give you a nice medium-rare roast. For an 8 pounder, expect it to take at least 2 hours, so shut the oven and don’t open it again until the next hour. After the second hour, you’ll probably be close, so you’ll want to check every 15 minutes (or less if it makes you feel better). Once the roast is done, move it to a platter immediately. Let it rest for at least 30 minutes before carving. It will release juices, which can be used as a simple sauce. You can also make a simple Gorgonzola sauce, which tastes fantastic with beef. 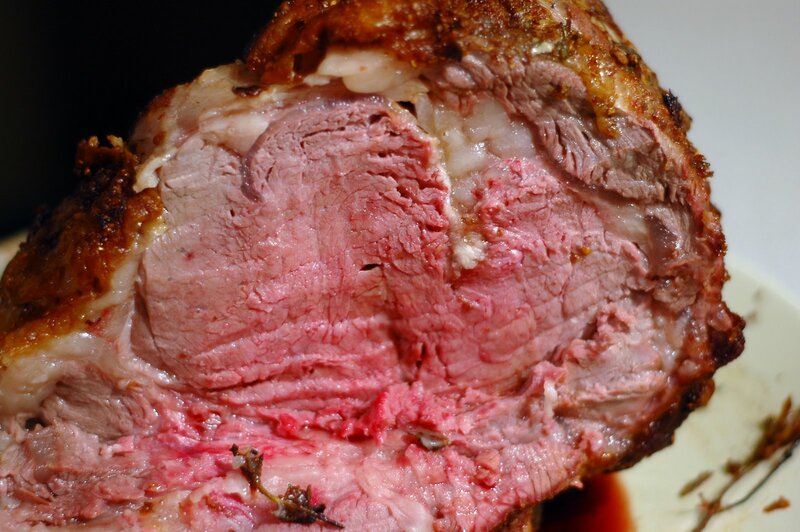 For the perfect roast, cook until the internal temperature reaches between 125° and 130°, but not one degree more. In a saucepan over low heat, melt the Gorgonzola with the heavy cream. Stir occasionally to promote even melting. When the cheese has melted, continue to simmer for an additional 5 minutes. Allow the sauce to cool to room temperature before adding in enough of the mayonnaise to thicken the sauce a little. Pour the sauce into a container and chill it in the fridge. Take it out about a half hour to an hour before serving. Using a fork or whisk, quickly whip the sauce to homogenize. It will have the consistency of sour cream. Hope everyone has a happy Christmas!!! It's just the three of us this year. We are having some friends over for brunch, but otherwise it will be a quiet holiday. I wanna know, how are you celebrating?? 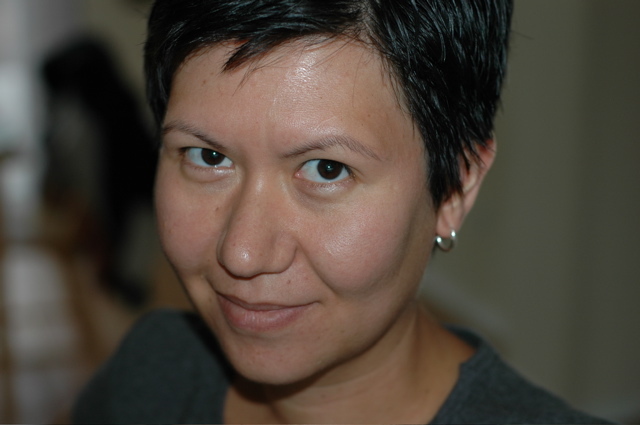 This picture was taken at Hubby's company party earlier this month. 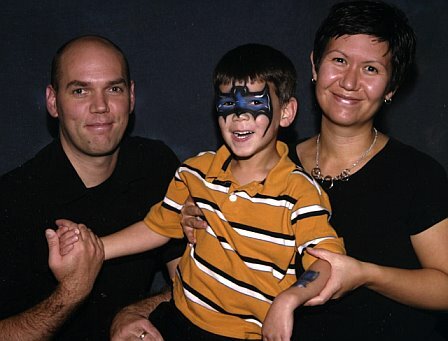 Note to self: take family photo before face painting. Compared to cooking a lot of things, prime rib is EZ! I think people just freak when they see how much it costs. My family's cooking method it to put it in a hot oven (450), cook for 5 mins per pound, then shut the oven completely OFF and don't peek. Perfectly rare + juicy every time. (if you want exact directions, I can email you) And my mom's method of seasoning it is still my absolute fave--you have to try it next time: pack a light layer of brown sugar on the top of the roast, esp on the fatty bits. Then season with Hawaiian salt (coarse salt), ground pepper, and crushed garlic. (No herbs, nothing green. )...It's the best. The top crust cannot be beat. Have fun with the ice cream maker!! I love mine. I want an extra bowl, though, so I can make 2 kinds at once. Stefania, the brown sugar sounds yummy. I will definitely try it next time! My mother and I were just talking about how much we wished we'd prepared prime rib on Christmas and then proceeded to talk ourselves out of it because it was too "hard" and too "risky" since it costs a small fortune in comparison to the more traditional and foolproof turkey or ham. Your dish looks great though and you've given me a boost of confidence. I'll be bookmarking this. Erin, go for it next time! It was so much easier than I expected. 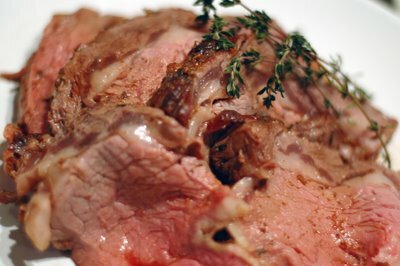 This sounds so yummy...I almost did prime rib for Christmas and now I wish I would have!